*We require a week stay with arrival on Saturday during peak season unless unit isn’t booked 28 days prior to arrival date. If cabin is open 28 days to arrival, we lower the minimum stay requirement to a 3 night stay. Voyageur Cabin has 6 beds and can sleep up to 10 people. This cabin is ideal for a family or a large group. This is the largest cabin at the resort. This Minnesota log cabin is one of our most popular cabin rentals and new for 2019 is air conditioned! The kitchen has been recently updated and remodeled and includes a dishwasher. Enjoy vaulted ceilings and plenty of room. The sliding glass door opens onto the large deck where you will have an amazing view of Pelican Lake. 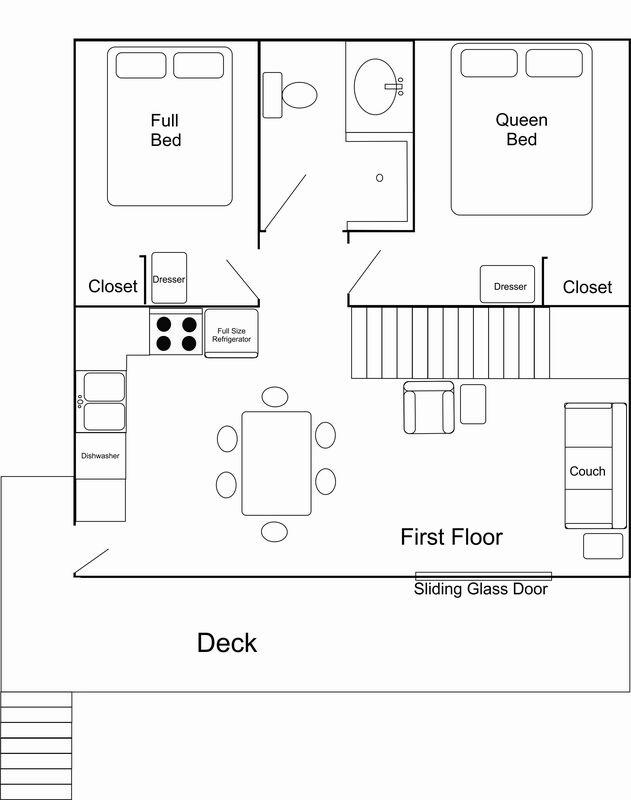 The main floor has two bedrooms, one with a queen bed and the other with a double bed. Upstairs the loft has two double beds and two twin beds. Cabin sleeps up to 10 people. The Voyageur cabin is rented on a 3 night minimum during spring and fall seasons. During peak season the Voyageur cabin is rented on weekly basis running from Saturday to Saturday. Our Spring season begins on May 10 and runs till May 25. Our Peak Summer Season begins Memorial Day weekend on May 25th and runs till August 10. The Fall season starts on August 10 and will run till October 20. All cabins are non-smoking cabins and pet free. Guests renting the Voyageur Cabin have access to the resort’s canoes, kayaks and stand up paddle boards at no additional cost.